Harmonie for Google Doc is a free add-in for Microsoft Outlook from Mainsoft. It allows all you to access all your Google Docs from within Outlook. From here you can mail them as attachment, or share them with peers. After installation, Harmonie sidebar will appear at the right side of Outlook window. To access your documents you have to login with your Google credentials when prompted. Once you have logged in successfully, it will list all the documents in your Google Docs account. From here you have options such as: upload, add, delete, rename, share, and create new document. Double-clicking the document will open the document in main Google Docs page in the default web browser. 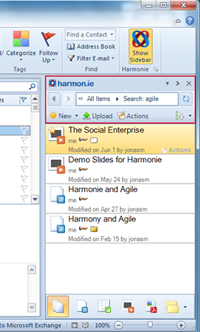 You can drag files to the Harmonie sidebar to upload and convert them to Google documents. It supports drag & drop which prevents user from having to manually attach the document. In mail compose window, you can easily drag the document from the sidebar into email main body to dynamically attach the file or share the link to the document. 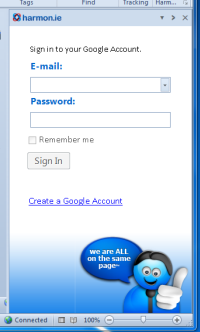 Harmonie for Google Doc works with Microsoft Outlook 2010 and Outlook 2007.